What are the Best Hybrid Golf Clubs? Hybrids are some of the most versatile clubs in golf. They can be used off the tee, to recover from the rough, off the fairway and even for low running chip shots. Adding the best hybrid golf clubs in your bag will give you confidence that you can get out of any situation on the course. Let’s turn those par 5s into birdie holes! Callaway is a leading club manufacturing company in the golf industry. in recent years they have produced world class products in every category. 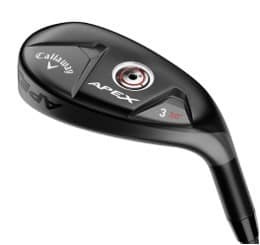 The Callaway Apex hybrid is one of those products. Because of its sleek design and iron like look, the Apex is the top pick for the best best hybrids golf club for 2017 – a hybrid that appeals mostly to professional players and low handicap amateur players. 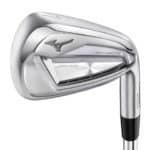 The head design features a longer iron- like blade look, with the center of gravity similar to a traditional iron. Having the traditional neutral center of gravity allows maximum workability that appeals to better golfers. 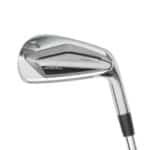 Carpenter 455 steel is used to make the forged clubface. this design feature delivers increased ball speed for both center and off-center hits. The Apex has an interchangeable weight in the club head for a customizable fit for any player. The Apex is a sleek designed hybrid that makes transitioning between woods and irons seamless. It has great feel and workability, making it the perfect combination for skilled golfers. 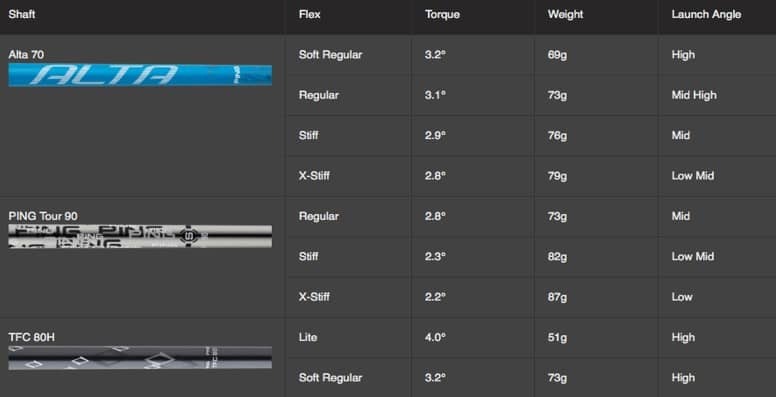 The Apex comes standard with a Mitsubishi Kuro Kage Black shaft, but can be ordered with a custom shaft as well. Going for a fitting is recommended in order to get the correct shaft. 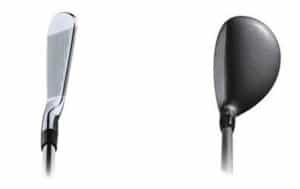 Face Cup technology refers to using a single piece of material at the front of the club head that encapsulates a curved striking surface, thus the entire clubface area is made of one piece of metal. Designers have much more flexibility when using this technology. Stronger materials can be used for the clubface in comparison to the steel used for the rest of the club head. Callaway uses this technology in all of their iron, wood, and hybrid designs. Internal standing wave technology focuses on weight distribution in the club head. This produces a lower center of gravity and increases Moment of Inertia (MOI). In combination with the forged face cup technology, it produces solidness of strike, increases feel and forgiveness, and produces higher ball speeds, which leads to maximum distance. The Apex has a forged face cup that produces additional ball speed, with the Carpenter 455 steel face providing great forgiveness and feel at impact. Gaining speed combined with plenty of forgiveness gives players the best of both worlds. The Apex comes with a D3 swing weight, which is standard for amateur male players. However, with the interchangeable weight in the head, the weight can be customized to suit each player individually. Being able to add additional weight to the head of the club is always a bonus, as some players might feel as if they need assistance with solidness of strike. The Apex has a reasonable price tag of $219.99. At first thought, it might seem pricey, but it is worth the splurge. The Apex is a high-quality hybrid club designed to provide many years of use and enjoyment. The Callaway Apex is a sleek traditional looking hybrid that suits the better player’s eye. It is jam-packed with technology to ensure great results. The Apex doesn’t offer extreme adjustability features in comparison to other clubs on the market, thus being properly fitted ensures the best head/shaft combination for each golfer. The Apex comes with a mid-range price tag making it an even more appealing option. Ping golf clubs are synonymous with quality— from their putters all the way to their drivers. Ping produces top-notch products to suit golfers at all levels of the game. Ping’s G series of hybrids sport a sleek design packed with cutting edge technology. The Ping G hybrid is a sleek designed hybrid packed with state-of-the-art technology. The Ping G features a Carpenter 455 steel face that produces consistently longer results. The sole of the club is a very important feature in hybrid club design, and the Ping G has a tiered internal sole. This is another feature that provides added distance. The Ping G’s center of gravity is situated in the lower back section of the club, promoting high launch with reduced spin. Players seeking height and control benefit greatly from adding the Ping G to their bags. The Ping G features Ping’s signature turbulator technology. In addition to improving aerodynamics, the turbulator technology also assists with alignment. The Ping G features a Carpenter 455 steel face, this high strength steel is precision-machined to variable thickness. This process reduces weight and maximizes flexing of the clubface to generate faster speed across the face, much like a tightened trampoline. A byproduct of this is consistently longer distances, exactly what the best hybrid golf club should give you. Sole design is a big feature in hybrids since the sole of the club is the part that interacts with the turf. The Ping G features an innovative sole structure in that its tiered internal sole is engineered to activate flexing. As a result, the ball deflects faster off the face for added distance. Turbulators are a signature feature in Ping’s designs for many years. Turbulators add aerodynamics to the design and assist with alignment as well. Contrasting grooves along with the captured look provided by the turbulators create a consistently centered impact position. The Ping G has a sleek design with cutting edge technology that assists players in obtaining increased distance, height, and consistency. This club suits golfers of any skill level, and offers benefits most golfers appreciate. Design features such as the Carpenter 455 steel face, along with a low center of gravity, produce ultimate forgiveness without compromising distance. This club gives great feedback to players. The Ping G comes standard with a D1 swing weight, as well as a interchangeable weight in the club head. This allows players to obtain optimal swing weight with ease. 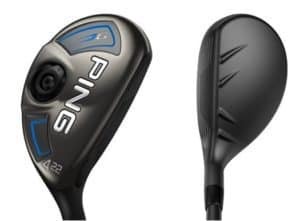 The Ping G has a very affordable price tag; $177.99 affords a technology packed hybrid from one of the leading club manufacturers in the business. The Ping G features a sleek traditional design with cutting edge technology that produces distance, height, and low spin rates for ultimate control. A very reasonable price tag makes it a must have club for players looking to trade in their long irons for a more user-friendly experience. Replacing long irons with hybrids can be an expensive exercise, but it doesn’t have to be. Although pre-owned clubs come at a considerable discount, many golfers prefer new clubs. With the numerous hybrids available, it is possible to have a new club at an affordable price. 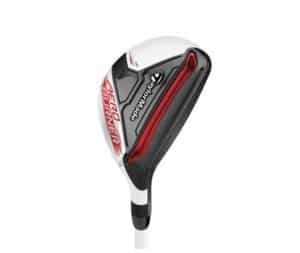 The TaylorMade Aeroburner Rescue is one of those options with a price tag of only $129.99. 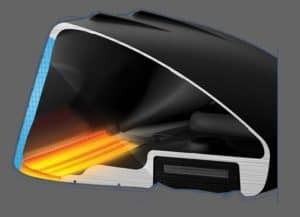 TaylorMade is an industry leader in the club design business, and the Aeroburner is a good example of one of their leading designs. Overshadowed by the release of the M series woods and hybrids, the Aeroburner is still a force to be reckoned with. The Aeroburner Rescue features an aerodynamic shape—the design has a shallow face and raised center crown—all of which aims to deliver maximum distance. The Aeroburner also features Speed Pocket technology, which increases the sweet spot of the club. A bigger sweet spot ensures off-center hits get maximum distance with reduced spin. The Aeroburner rescue is available in both a white and a black finish. 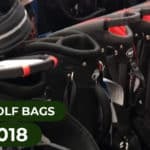 This well-designed hybrid compares well with most of the new hybrids on the market, and is a great addition to the bag if you’re looking to save some money. Have trouble swinging the hybrid style club? Consider a utility iron as an alternative. They have comparable forgiveness and length while giving you a little more control. For players who can’t wrap their heads around the idea of swapping out a long iron for a hybrid, the utility club might just be the answer. It offers the technological advances of a hybrid, but it still has the traditional look of a long iron. Utility irons are normally available in two, three, and four irons. 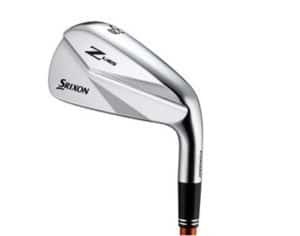 The Srixon Z U65 utility features a sleek design that looks like a traditional long iron, but it is filled with technology similar to that of a hybrid. The Z U65 offers unsurpassed feel and distance to its players. This club has a high strength SUP10 face insert that produces high ball speeds, and as a result, more distance. The grooves on the Z U65 are double laser milled to improve strike and produce consistent spin. The club features a hollow head, which allows weight to be repositioned low in the head. This results in a higher initial launch. The Z U65 is available in a two,three, and four iron, and it comes standard with a Miyazaki Kaula 7 graphite shaft. With a price tag of $199.99, it costs about the same as a hybrid. The U65 is a great alternative for golfers seeking the technology of a hybrid but the look of a long iron. Hybrid technology has changed the face of the long game, especially for amateurs with low swing speeds. Technology allows players to get the ball in the air easier and hit it further than they use to with long irons. Adams Golf used to be the leader in hybrid iron sets, but since TaylorMade acquired Adams, the brand has melted away. The hybrid set is a game changer for players who struggle with a lack of club head speed, in particular, senior and female players. 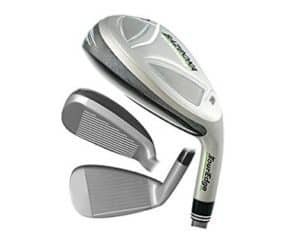 However, players shouldn’t be concerned with the disappearance of Adams because Tour Edge has a hybrid set available, and it is called the Bazooka Platinum. The Bazooka Platinum features two heavy weights in the sole of the club. This added weight offers forgiveness at the point of impact. Due to the weight distribution in the club head, the Bazooka has a low center of gravity that promotes a higher launch angle, allowing players to get the ball in the air more easily. The design of the longer irons mimics that of hybrids, and the shorter scoring irons look more like traditional irons. Bazooka irons are available individually for around $59.99, with the lowest lofted club being 18 degrees and the highest being 59 degrees. Players are able to create a customized set of hybrid-like irons to suit their game perfectly. The Bazooka Platinum are the best hybrids for the money if you’re just getting into golf or trying to save money to play more rounds. Back in the day when Arnold Palmer and Jack Nicklaus were topping leaderboards, 1 irons and 2 irons were prominent fixtures in their bags. They were magicians with those clubs and could hit many great shots with them. Great ball strikers had a considerable advantage over the rest of the field in those days. 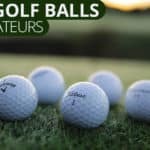 Regular amateur golfers, however, dread hitting longer irons because to many of them, the ball looks bigger than the club head itself. When the hybrid club was introduced, it turned hitting those dreaded long iron shots into a much easier task. Most professional men’s golfers still prefer having three and four irons in their bags, with some even carrying two irons. However, women’s professional golfers and amateur players benefit tremendously from hybrid clubs. Hybrids assist players in numerous ways including allowing them to hit the ball in the air with less effort, helping them control distance more accurately, and most importantly, they are less intimidating than long irons. Hybrids have a similar anatomy to a fairway wood, but in most cases, the club head is smaller, making it the perfect crossover between fairway woods and irons. As is the case with any type of club, different manufacturers have different shapes and looks based on their technologies, but below is an illustration of what a standard hybrid club looks like. Most hybrids on the market today are adjustable. This allows players to customize a fit that is right for them. Adjustability changes several different components such as loft and lie, draw or fade bias (thus a more open or closed clubface), and weight. 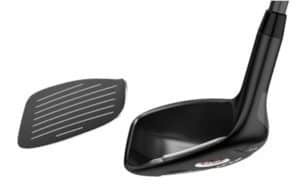 When we discuss the anatomy of a hybrid, there aren’t any extreme components to speak of, but it is very important to talk about the sole, or bottom, of the club. 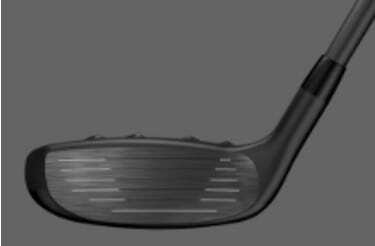 Some designs play around with the leading edge of the club, which is the bottom edge of the club that forms the edge between the clubface and the sole of the club. Others have designs that feature two-tiered soles. Both of these design features improve turf interaction. Hybrids glide through the turf more easily, aided by the design functions just mentioned, thus making them much more user-friendly in comparison to long irons. When looking at a hybrid and a long iron side by side, most golfers agree that a hybrid looks like the more user-friendly option. Hybrids, due to their design, offer a club that is much more forgiving. High handicappers in particular, benefit greatly from this design. Another advantage for high handicappers is the fact that the hybrid design ensures off center strikes get results close to miss hit shots. Smashing a long iron out of the middle of the clubface is a wonderful feeling, but more often than not, amateurs miss hit their long iron shots. Miss hit long iron shots tend to travel much shorter distances than well hit iron shots. Hybrids, though, offer technology that ensures miss hit shots travel a similar distance as well struck shots. Irons are bendable in order to change lie and loft, but hybrids offer many different adjustability options. Having adjustability options ensures golfers find a club that suits their swing instead of having to alter their swing to fit a certain club. The majority of hybrids on the market today come with adjustability options that alter the weight of the club head, along with the club head angle. Hybrids can be set up to promote a fade or a draw, and trajectory can also be adjusted as well. Players who struggle to get longer irons into the air benefit greatly from this adjustability feature. The above image illustrates the adjustable hosel that alters clubface angles. These angles alter loft, lie, and draw or fade biases. Changing weights in the head alters swing weight, which affects ball flight. Hybrids make a huge difference in the women’s professional game for this exact reason. Female players have lower swing speeds, thus hitting a high trajectory with a long iron is very tough for the majority of female players. When hybrids were introduced to the market, female golfers jumped at the opportunity to have a club that would allow them to hit high so the ball would land softly on the green. The majority of players with the LPGA Tour carry two or even three hybrids in their bags, thus the longest irons they have in their bags are a five or a six iron. Long irons are very tricky to use when hitting balls out of tall, sticky grass. Amateurs who try hacking a four iron 220 yards out of the rough often end up regretting their decision to even attempt it. Hybrids, by design, are much easier to use when hitting balls out of the rough thanks to their sharper leading edges, additional weight behind the sweet spot, and higher launch angle. Players hitting out of the rough find they have better success when using a hybrid club. In addition to being used to hit long shots from more than 200 yards, Hybrids are becoming a popular club around the greens. Hybrids have opened up a completely new area of shot-making that never existed before. PGA Tour players perfected the hybrid chip shot—the wide flat sole and shallow loft gets the ball rolling quickly. It is a great shot to have when playing firm golf courses because it is much easier to roll it up close to the hole with a hybrid versus what it is to hit a flop shot with a high lofted wedge. Hybrids have their own category in the golfing industry. 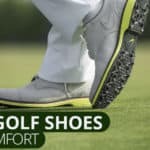 Their technology focuses mainly on three different aspects: sole design, MOI, and adjustability. Sole design is the component that gives hybrids their unique spot in the marketplace. The sole is the part of the club that interacts with the ground. As such, introducing technology to this part of the club is imperative. Different manufacturers use different technologies. For instance, Titleist hybrids have a relieved leading edge and active recoil channel edge that ensures the club glides across the ground with ease. 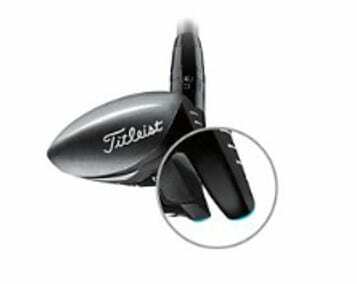 Below is a picture that illustrates the sole design used by Titleist. Ping hybrid designs also emphasize sole design features. Ping uses Tiered Internal Sole technology. This innovative technology activates flexing within the club head, which results in added distance because the ball deflects off the face faster. Below is a picture that illustrates the sole design of a Ping hybrid. MOI in a golf club refers to a club’s resistance to twisting. A higher MOI ensures that off center hits still get maximum distance and less dispersion. Most hybrids have a high MOI, with different companies using different technologies to produce unique hybrid clubs with high MOI Ratings. As mentioned above, hybrids offer several adjustability options. Most hybrids have a system that allows a player to adjust the loft, lie, and clubface angle. Normally, this adjustment system is situated in the hosel of the club. By using this feature, a club can be set up to fit a player’s unique swing. If a player struggles with missing the ball consistently in a certain direction; the club can be set up to eliminate that bad shot. Adding/removing weight, or moving weight to different parts of the club head, is another adjustability feature found in most hybrid clubs. 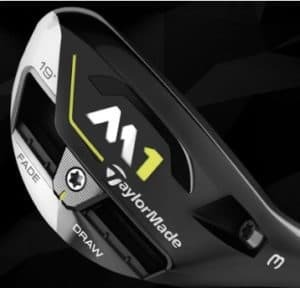 TaylorMade introduced the sliding weight to its M1 design, while many other companies feature designs with removable weights for a lighter or a heavier swing. Below is an illustration of the M1 sliding weight track. In this design, the weight changes the draw/fade bias of the club. This is a unique feature offered by TaylorMade. Most other hybrid designs have replaceable weights in a fixed location on the club head. Having the ability to change the weight of the club head allows players to build a club with a swing weight perfectly suited to them. Swing weight is a very important aspect that most amateurs neglect. Players with slower swing speeds require clubs with lower swing weights. This is especially important later on in a round when players get tired. It is important to note here that the swing weight of a club has nothing to do with the overall weight of the club. Just because the overall weight of the club is light doesn’t mean that the swing weight of the club is low. Let’s take a minute to understand the basics of swing weight. Having a good understanding of this concept is beneficial to any player. The swing weight of a golf club specifies how heavy the club feels to the player as he or she swings it. In short, swing weight refers to the distribution of weight in a golf club. 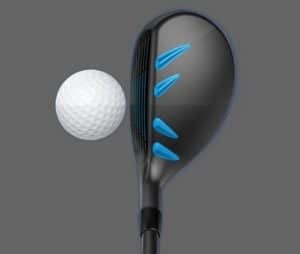 A club with more of its mass concentrated in the club head has a higher swing weight and requires more energy for the golfer to swing at a specific speed. Understanding this helps explain why hybrids with interchangeable weights have different swing weights depending on which weight is placed in its head. The difference between swing weights can be quantified as the weight of a dollar bill. This sounds very minimal, however, a small change makes a big difference. It is very important to recheck your swing weights when getting your clubs regripped because, as mentioned above, even a slight change can alter your swing weight drastically. Stronger players with higher swing speeds require clubs with a higher swing weight, and vice versa for players with slower swing speeds. The perfect swing speed for each player, however, is one that is light enough for the player to achieve enough club head speed for proper distance and ball flight, but heavy enough to transfer sufficient energy to the ball and keep the club on track in the downswing. 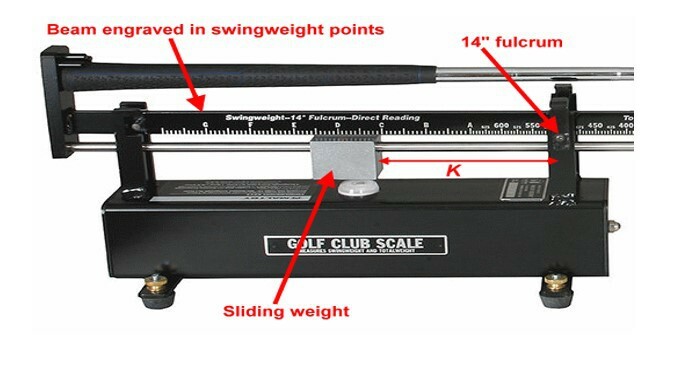 Below is an illustration of what a swing weight scale looks like. Swing weights range from A 1-9 to F 1-9, with A0 being the lightest and F9 being the heaviest. On average, most standard men’s clubs have a swing weight of D2; women’s clubs are standard at C7. The majority of professional players prefer slightly heavier swing weights on their wedges in comparison to their irons, but once again, it is personal preference. Always make sure when you get a new club/clubs to check the lie, loft, and swing weights on them. You should be able to get it done at your local pro shop. Hybrids are phenomenal clubs that make a considerable difference in a player’s game, but it is important to choose the correct club in order to obtain maximum results. When referring to the “correct hybrid”, the club brand is of little importance. However, the correct number/loft hybrid is. 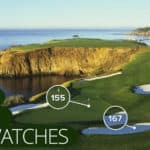 In order to determine this, a player has to know how far they hit their long irons and woods. When replacing your three iron with a hybrid, simply choosing a three hybrid is not necessarily the right choice. Below are the specs for TaylorMade’s M1 irons and hybrids. With some reading, it’s easy to see a slight difference between the irons and hybrids. The M1 three iron has 18 degrees of loft, while the M1 three hybrid has 19 degrees of loft. Hybrids by design go further than irons with the same loft, thus replacing a three iron with a three hybrid will leave a gap between your hybrid and four iron. Going for a fitting with a professional is the best way to ensure players get a perfect hybrid club fit. Below are the average Trackman numbers for the PGA Tour. On average, they carry their hybrids about 10-15 yards further than their three irons, and only five yards less than their five woods. It is very important that all clubs in a bag complement each other. Golfers only carry 14 clubs and must choose wisely. 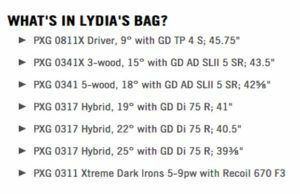 To illustrate how different players add hybrids to their sets, let’s take a look at what is in the bag of some of the top men’s and women’s professionals. Lydia Ko, who dominates the women’s game, has a very different setup compared to power players in the men’s game such as Dustin Johnson and Jordan Spieth. As seen above, Ko has three hybrids in her bag along with a five wood and a three wood. Ko knows her game and has clubs in her bag to illustrates that. In comparison, below is what Jordan Spieth carries in his bag. He only has 1 fairway wood and 1 hybrid in the bag. Men’s and women’s golf differs considerably. On the PGA Tour, big drives and wedge shots seem to be the nature of the game, whereas the women’s game is more synonymous with accuracy. At this point, it is easy to see that hybrid clubs have made the game easier for players at all levels. Hybrids have changed the face of the LPGA Tour, and they are becoming more and more popular on the PGA Tour. Many amateurs carry at least one hybrid in their bags as well. Some companies have even taken it a step further and launched complete hybrid sets. It might sound extreme, but adding technology that promotes distance and height to a full set of clubs does have merit. Amateur women and senior male amateurs who struggle to get club head speed benefit most from full hybrid sets. As such, it is easy to see there is a place for these “game improvement sets” in the marketplace. Adams Golf used to be a leader in hybrid design—they made full hybrid sets that were very popular and many can still be found in the bags of players today. However, when TaylorMade bought out the Adams Golf brand, those clubs/sets disappeared from the market. For players who aren’t sold on the idea of a hybrid, a different option does exist. Utility irons are found in the bags of many professionals around the world. They offer offer similar technology and performance compared to hybrids, but they look and feel more like traditional long irons. Utility irons are normally available in two, three, and four-iron options and are a great option for players to consider if they are looking for the best of both worlds. If you tend to be more confident with long irons compared to your 3W or other rescue clubs, you’ll probably outperform even the best hybrid golf clubs with the right utility iron.